Skye, Kilchrist. 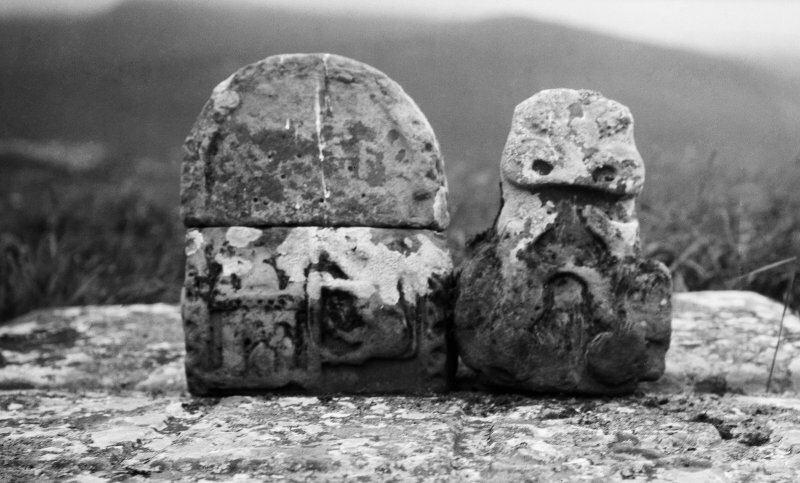 Detail of two stones found in the churchyard. On the left, an armorial stone in two pieces; on the right a fragement of a cross-shaft. 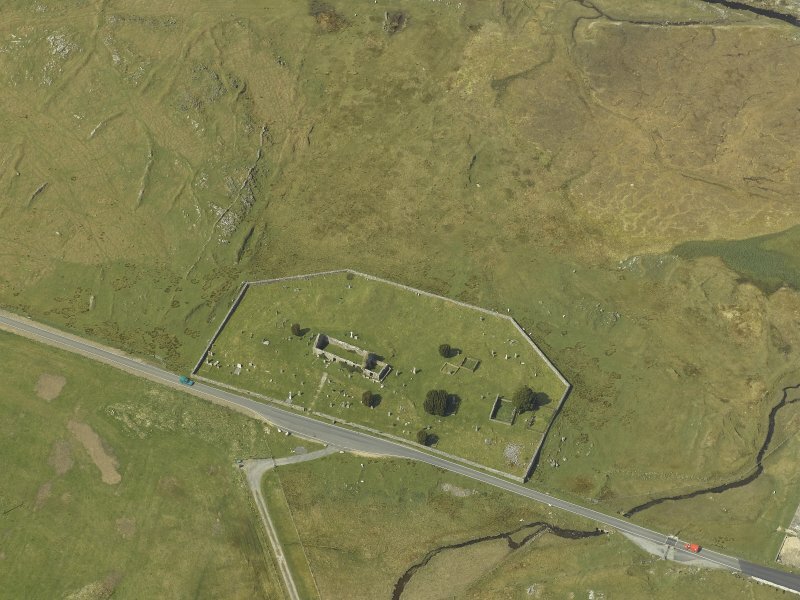 Oblique aerial view centred on the graveyard and the remains of the church, taken from the SW.
Oblique aerial view centred on the graveyard and the remains of the church, taken from the NE. 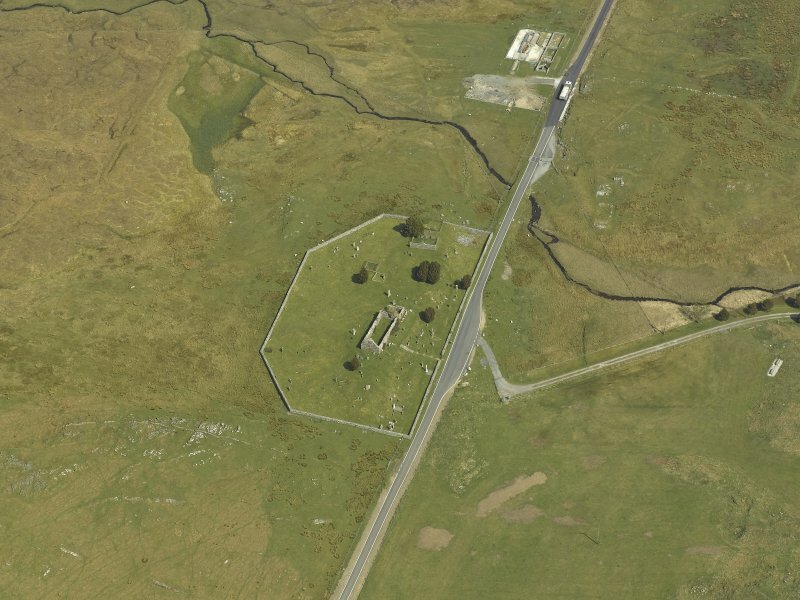 Oblique aerial view centred on the graveyard and the remains of the church, taken from the SE. Cill Chriosd (Kilchrist), late 16th/early 17th century, replacing a medieval structure The long, low, rubble ruin of the post- Reformation parish church of Strath has roughly dressed quoins and jambs, and a balustraded burial enclosure added to the east gable in the early 18th century for the Mackinnons. In the south corner of the graveyard, a worn medieval slab carved with an ornate cross; headstones mostly 18th and 19th century. Kilchrist Church, dating probably from the late 16th- early 17th century measures 52ft 9ins by 17ft 6ins internally, the main axis varying 30 from due E-W. There are no openings in the N and W walls. The side walls, 8ft high, are 2ft 3ins and the gables 2ft 10ins in thickness. The church is entered by a doorway with splayed jambs and check and square sconsions in the S wall, in which there are three windows, with check and inward splay. A similar window, now built up, is in the E. gable. There was in 1505 a presentation of Kenneth ("Kensoch") Adamson, chaplain to the rectory and vicarage of 'Kilchrist in Askimilruby .... in Strasuordale", vacant by the death of the last possessor, "John MacGillebredison". 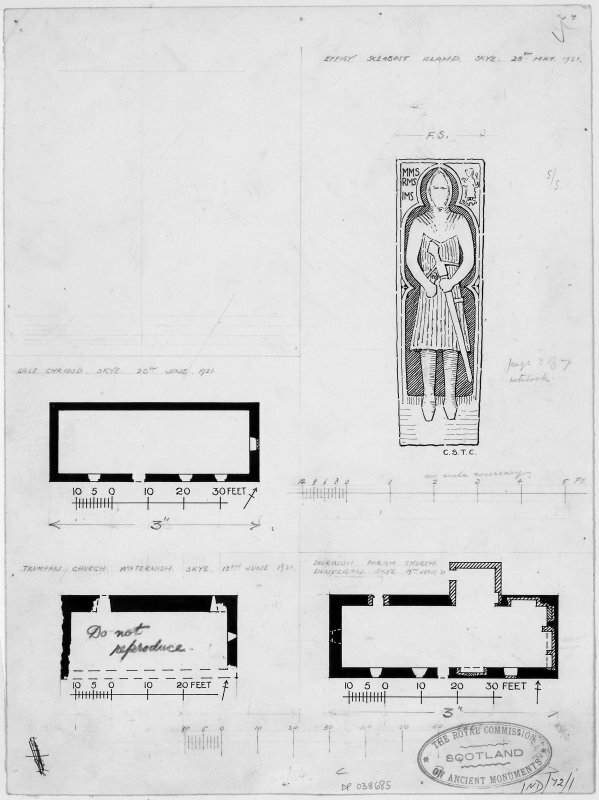 In 1508 John Ronaldson was presented to "the rectory of the parish church of Strath called Cristis Kirk, vacant by the death of the late rector John Johnson" (RCAHMS 1928). About 1840 a new church was built at Broadford (OPS 1854). Lying in the churchyard is an armorial stone. Another fragment in the churchyard, crude in execution, appears to be the necking and lower arms of a cross. The lower portion is carved with two animals in relief. The reverse is plain. There is also a recumbent slab of slate containing a foliated cross. The dexter side of the cross is well preserved, but the greater part of the other side has been entirely worn away (RCAHMS 1928). Orig Paroch Scot 1854; Reg Sec Sig Reg Scot 1908; RCAHMS 1928. 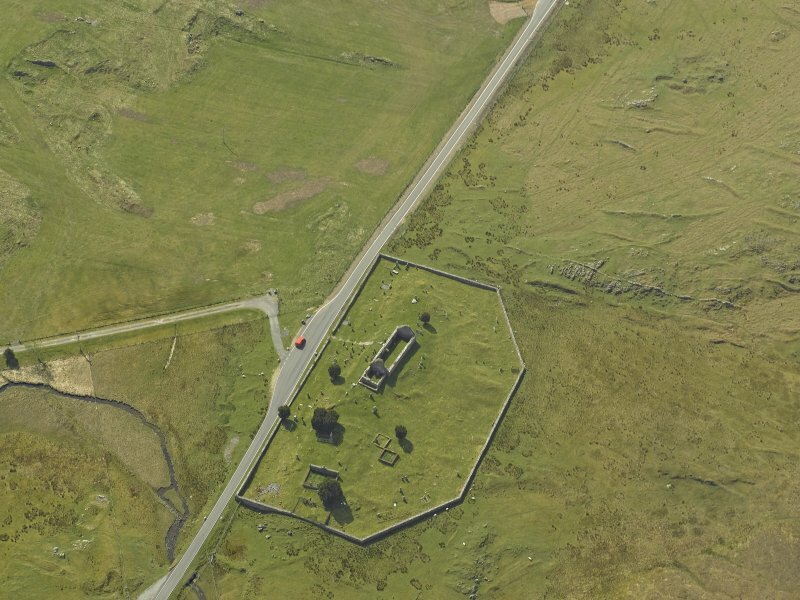 Cill Chriosd: as described by RCAHMS and ruinous. The armorial stones, etc. were not seen. Visited by OS (A C) 17 April 1961. Repair of the Kirk of Kilchrist. Five watching briefs were undertaken, 27 February – 27 June 2014, on sections of the new water main pipeline between Broadford and Elgol. This work was carried out in response to recommendations made following a walkover survey of the pipeline route in 2013 (DES 2013, 118–9). ephemeral build. This possibly indicates the temporary nature of the railway, the whole enterprise being abandoned for good in 1939. NG 61706 20696 Kilchrist Church and Graveyard The watching brief carried out at Kilchrist, in particular, around the church and graveyard enclosure, produced no archaeological features or finds. This was a very surprising result considering the close proximity of the graveyard enclosure wall and the depth of time the church had potentially been in use. However, the ground through which the pipe trench was cut included low lying wet ground and chaotic topography with outcropping limestone bedrock and natural volcanic dolerite swarm dykes. deposits. With the exception of a few sherds of modern bottle glass and industrial period ceramics, no deposits, features or finds were encountered. However, the location of the well was recorded in detail. NG 54814 17503 Kilmarie Bridge At Kilmarie the pipe trench cut through the bridge, which is dated 1776, but failed to produce any structural evidence for the earliest bridge or road surfaces. An earlier inspection of the bridge had recorded unusually high parapets and old drain culverts that were located at some depth below the current tarmac road surface. Although the pipe trench attained a depth of 0.9m below the current road level, the only deposits identified appeared to be infill material. This had probably been used to fill the area between the raised parapets during modifications to strengthen the bridge in the recent past. siltstone bedrock, may indicate that these features relate to earlier, prehistoric activity at the site.